7:00 a.m. to dusk. Regular Weekly Maintenance Notice - Tipps Canine Hollow is CLOSED ON WEDNESDAYS from 7:00 a.m. to 11:00 a.m. for park maintenance. Tipps Canine Hollow provides a safe environment for pet owners to unleash their dogs and let them exercise and socialize freely without disrupting the activities of others. Park hours are 7 a.m. to dusk daily. Children under the age of 12 must be accompanied by an adult when visiting the dog park, and children under 7 are not allowed in the large dog area. These rules are posted near the park's entry gates. Taser devices are not allowed to be used in the dog park. Weekly Maintenance Notice: Tipps Canine Hollow is CLOSED on Wednesdays from 7 a.m. to 11 a.m. for park maintenance. The park will open at 11 a.m. on Wednesdays. No public access or use of the park is available during this weekly maintenance. Tipps Canine Hollow cannot be reserved, and there is no solicitation at this park. 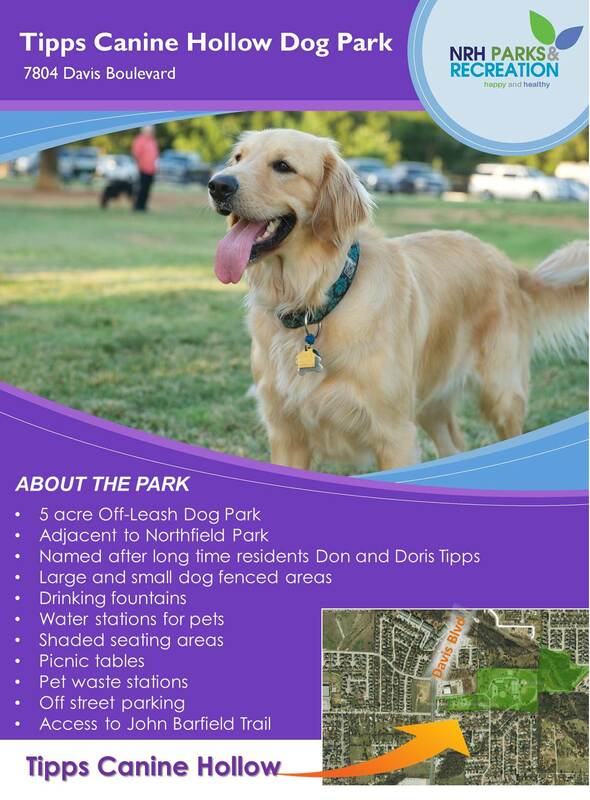 Are you interested in helping to form a Dog Park Association? The Association would support park improvements including lights, events and programs at Tipps Canine Hollow Dog Park. If you are interested, please contact Adrien Pekurney, Assistant Director of Parks and Recreation, at 817-427-6620.